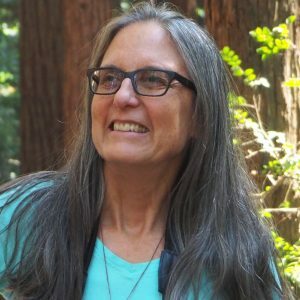 Leanne Grossman is a Bay Area naturalist and writer with Certificates in natural history, and environmental management and technology. In nature I find peace, renewal and truth. I hear the beat of nature’s heart. As a child I loved hiking up mountains and crossing clean fresh water streams. It was not yet polluted and we kids cupped our hands to drink the water right out of the pools collecting in pockets of Headwaters Creek in the San Bernadino mountains when we climbed to the peak, San Gregorio. The benefits of nature to our health and well-being have now been scientifically documented. And I believe that we protect what we love. Getting into nature, if we treat it respectfully, can therefore benefit all living creatures. Personally I feel blessed to be able to spend more time in nature now, and share my knowledge of and passion for it with people from all backgrounds and ages. I’ve taught over a thousand children and adults alike. When students peer into my nature kit, they might find animal skeletons or a butterfly wing or a crosscut of a redwood branch. 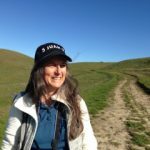 Living on the Pacific migratory flyway as we do, guarantees we will see a range of fascinating shorebirds and songbirds any day of the week to pique our curiosity about their habits and habitats. To return local landscapes to cleaner, more natural states requires commitment and lots of hard, hands-on work. A rising tide of people is dedicated to removing invasive species of plants and animals, planting natives in their place and reviving watersheds throughout the area. I participate in Friends of Sausal Creek‘s restoration work in my neighborhood. It works — an expanding number of bird species have returned along with a few fish. Where is your watershed? Let me know what kinds of places you would like to visit and we’ll make new discoveries in our nearby parks and waterways. In my down time, I play the West African djembe, take on friends and foes in Scrabble, and photograph wild places.